I had just met Jennifer earlier that morning when visiting Thistle Farms, a social enterprise in Nashville, Tennessee that works in partnership with the nonprofit Magdalene to rebuild the lives of women who’ve been caught in cycles of dealing drugs and selling their bodies. In conjunction with providing housing and counseling, the program trains and employs women to create beautiful candles and beauty products from natural products such as the thistle. Last year, the successful business met the $1 million sales mark, as covered in a piece by NPR. A month before my visit I had emailed the farm asking if I could interview one of the women there. In response, Jennifer, their PR woman, had replied saying she would be happy to connect me with one of her beautiful sisters and mentioned that she herself was a graduate from their 2012 program. I had prepared an interview that wouldn’t delve too deeply into the personal life of someone I didn’t know, aiming to ask questions concerning the social enterprise from the perspective of a woman in the program. Yet after attending the midweek “Meditation Circle” with dozens of other visitors, staff and volunteers, she had lead me outside to a table between their shop and alley so we could chat in private and Jennifer herself shared her life story with me. 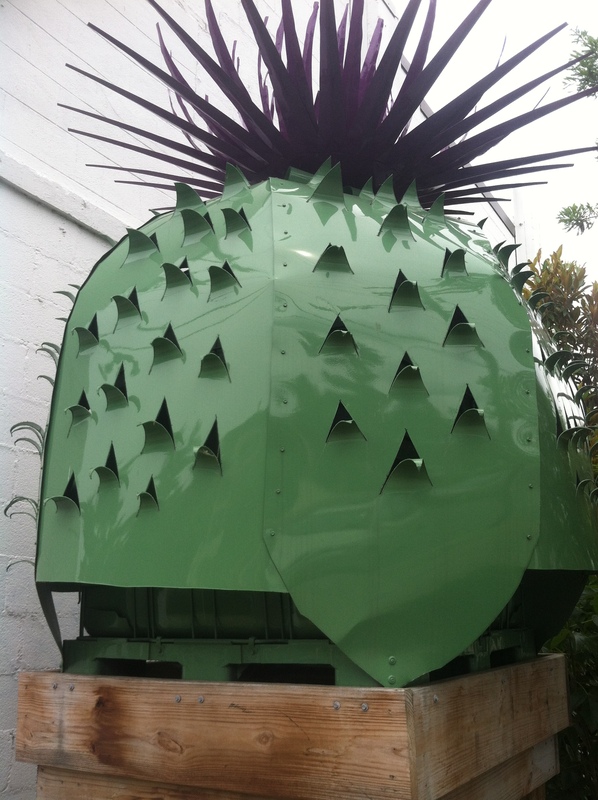 Shaped like a thistle, this art piece collects rain water. They don’t like to waste anything but to repurpose what others would discard both to care for the planet and as a metaphor for the women whose lives are being rebuilt. “At age 16 I met a man who got me pregnant and at age 17 we married,” she continued. “I thought my life had turned around. But after giving birth to a second child who was stillborn at age 19, I became so upset with the world I divorced him. I left my other child who was two-years-old with my mother and started working at a gentlemen’s club.” She gazed off at the bleak sky. Although the day was overcast the June air was warm and humid here in Nashville. “Before long, I was on the street, jumping into strangers’ cars and selling myself to support my drug addiction. I moved from marijuana to meth to liquid meth to heroine. I was trying to be something I wasn’t. Even my eyes changed color from their natural state to a murky brown from all the poison.” I gazed into her shining blue eyes that matched the light blue t-shirt she was wearing and wondered how they could have ever appeared a murky brown. “Finally, I started to attend church with my sister, all the while I was still doing heroin.” She paused for a puff on her cigarette, the one addiction she had not yet kicked. “Then one day I set up an appointment with the priest for confession. While there I told him I needed a rehabilitation program that would last two years. In the past I’d gone through 90 day ones but they’d left me unchanged. He said he would find something for me and the next time we met up he told me about Magdalene. It was exactly what I was looking for: a two year program that was out-of-state in Nashville and away from Dayton, Ohio, where I was living. Hearing that a place like that existed, I walked away with a big smile on my face, the first time my sister had seen me smile in years!” Jennifer beamed as she recalled that moment. 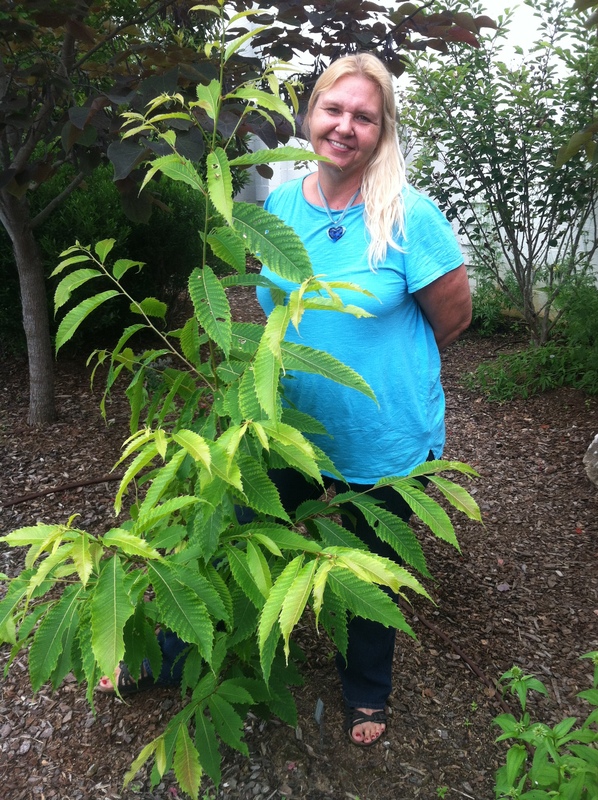 Jennifer next to an American chestnut tree that taught her a life lesson. “I wanted to go immediately,but there was a one to two year waiting period! I knew I couldn’t wait that long and called regularly to see if they could get me in sooner. Finally, out of complete desperation, one day I told them I wouldn’t make it unless they let me in. The woman on the other end of the line asked me, ‘How soon can you come?’ I wanted to tell her ‘tomorrow,’ but then realized I had to figure out a way to get there. Jennifer laughed with her raspy chuckle and brushed her chest-length, dyed blond hair behind her shoulder. “I arrived on March 10, 2010, and didn’t unpack for 60 days.” She ended up staying, however, not only graduating from the program but moving now into the role of PR & Development, giving tours to daily guests and explaining the history and partnerships of the organization. 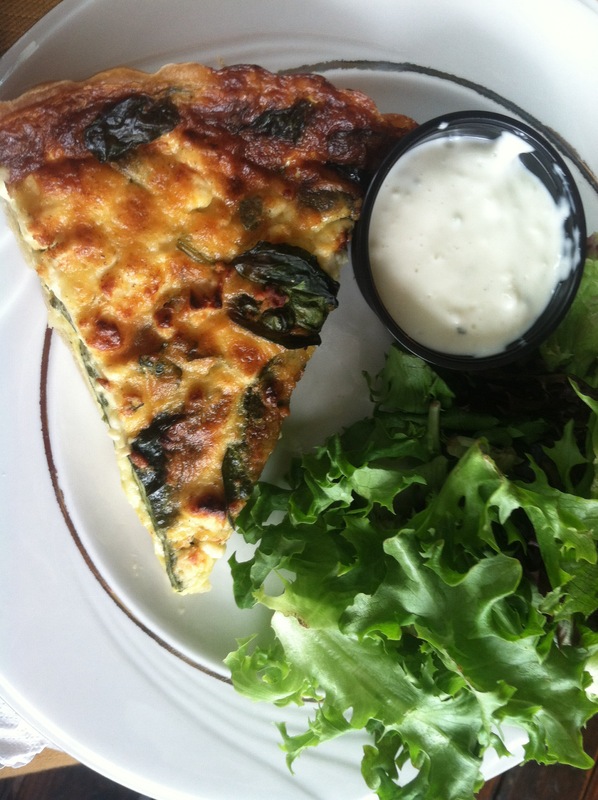 A scrumptious quiche and salad I purchased at the Thistle Cafe. Me and Jennifer in front of some Thistle Farm products. “Healing, hope, love, all natural, community, life, abundance, joy, laughter, MUSIC!” she yelled the last word. Then interjected “Brenda, can I have a cigarette?” when another employee passed by us. “With my mouth shut.” Jennifer replied. That made me laugh. But she continued, “If things don’t sell, we nix them. But we try all of them,” she said, referring to ideas customers offer them. 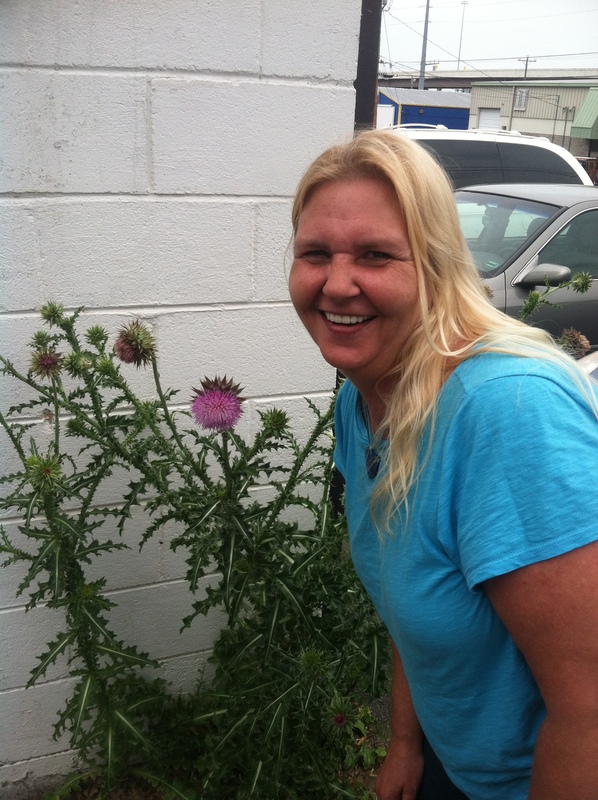 She told me that Thistle Farms only has one fundraiser per year because Becca doesn’t like to constantly ask people for money. Otherwise, they post concrete needs such as lumbar supplies on their volunteer page. 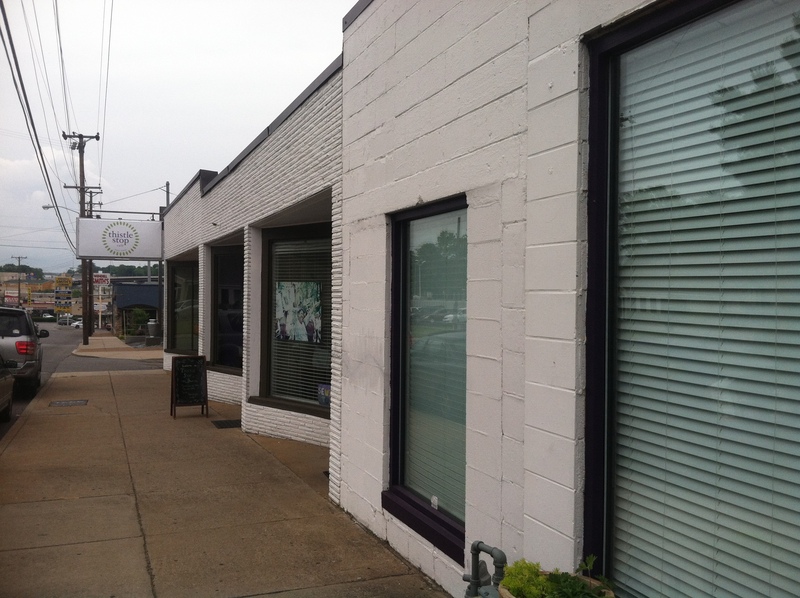 The unassuming structure where this social enterprise is housed. When I asked about partnerships Thistle Farms has with other businesses, organizations or nonprofits, Jennifer exclaimed, “All over movement. I LOVE movements!” I knew that Thistle Farms partners with multiple organizations. She had just told me about their first national Thistle Farms conference coming up this fall where Nicholas Kristof and Sheryl WuDunn, authors of Half the Sky will be speaking. And earlier during the tour of their facilities, Jennifer had described all sorts of organizations they are partnering with globally and locally. For example, guys in prison built the cabinets in their cafe. Jennifer replied, “Love heals. The women on waiting list get in.” Later as we parted ways, she added, “The bottom line is definitely women on the street—there’s nothing below that!” I wasn’t sure if she was referring to the business definition of the “bottom line” but in the end it didn’t really matter. I’m sure the Thistle Farm’s founder Becca would agree! Thistle Farms is a social enterprise of women who have survived prostitution, trafficking and addiction. Thistle Farms houses the bath and body care company, Thistle Stop Café and paper and sewing studios.The community provides housing, food, healthcare, therapy and education, without charging residents or receiving government funding. Thistle Farms and Magdalene stand as a witness to the truth that in the end love is the most powerful force for change (description taken from the Thistle Farm Facebook “About” section). Their one annual fundraiser is this weekend, October 12-14, in Nashville, Tennessee. This interview is a paraphrase based on notes and listening to a conversation with Jennifer on June 4, 2014.